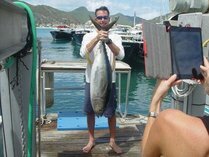 St martin fishing | Fishing St Maarten Charter - Index. Ready for Action, Adventure, Excitement and the experience of a lifetime? 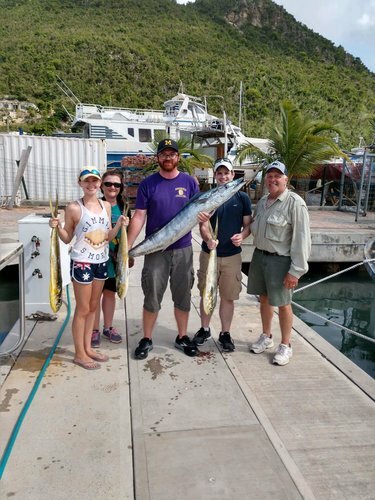 Join The fishing St Maarten st maarten Fishing charter crew aboard the vessel "Raphaella"for an exciting day of deep sea fishing charter with friends and family. Just click on contact below and send us a note with no obligationand we will get back to you as soon as possible. 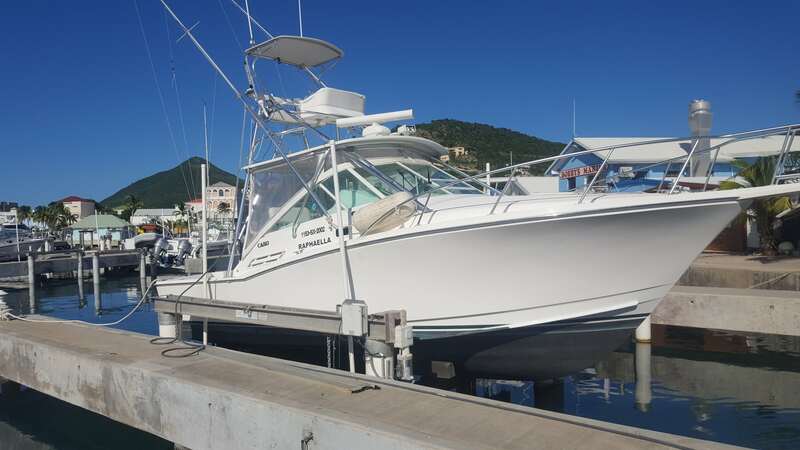 The Captain of st martin fishing / fishing st maarten charter and his crew have over 50 years combined deep sea fishing charter experience across St Maarten / st martin, the Caribbean sea to the Atlantic Ocean - index. Raphaella and Crew for the past 15 years have been the fishing vessel of choice for most of our cruise ship guests visiting our St Maarten port in Great Bay Phillipsburg. 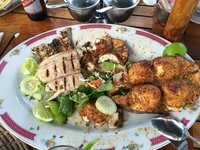 Happy Customers enjoying their Delicious catch of MahiMahi (Dorado/Dolphin) on the left and Delicious Wahoo (Mula) to the right on the plate , they hook-it, land-it, and eat-it. 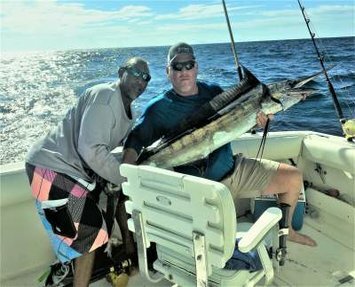 Just click on "Contact Us" BUTTON below and send us a note with no obligation and we will get back to you as soon as possible..
You can sign up for a 1/2 day fishing or 3/4 day fishing or a full day of St Martin fishing st maarten charters. 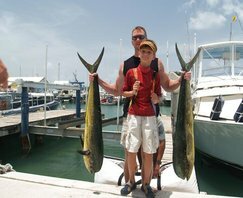 St Maarten/martin Fishing charters can start as early as 7:00 A.M.The half-day fishing charter lasts for about 4 hours and the three-quarter day fishing charter will last about 6 hours. 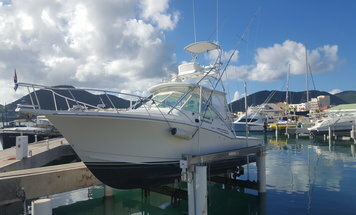 For the half and 3/4 day fishing charters depending on sea conditions, you will head out to the South Drop of St Maarten located approximately 4.5 miles (20 minutes) from the port.Some of our crew members come from St.Kits/Sint Maarten and bring the unique experience of fishing the Trench Drop Off. St.Kits is well known for its abundance of big game fish and ballyhoo which is used for food and bait. This area is actually a ledge that runs from Puerto Rico to as far as Dominica. This ledge better known as the Puerto Rican Trench also runs between St Maarten and St. Kitts and is a favorite hangout for big game fish of all species. 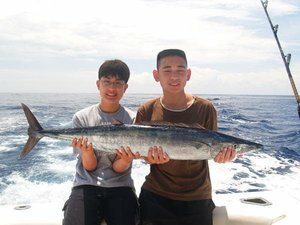 Trips include complementary drinks with a small snack along with bait and tackle - (index). In addition to Deep Sea Fishing st maarten Charter St Maarten/St Martin has to offer, you will find a vast amount of tourist attractions just minutes away from the Cruise ship Dock in Phillipsburg, St Maarten.Our beautiful beaches are walking distance away, so get away for the day and enjoy an exciting day of St Maarten Deep Sea Fishing Charter. 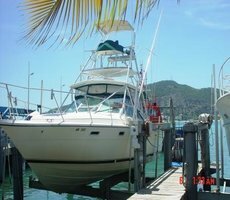 Its our goal to ensure your comfort and enjoyment for the day, so come on out and go on a fish charter, swimming, snorkeling on the beaches or just lay on the white sands of our beaches and enjoy the St Maarten Sun! Visit raphaella's profile on Pinterest.